211 days, 09 hours, 04 minutes and 32 seconds. 11 April 1942, City of Enem in the Tahtamuka district - Adygei Autonomous Republic, Krasnodar region (USSR). Russian (on documents), Ukrainian (origin). 1959 - Attends the secondary school in Enem for 10 years. 1965 - Earns a diploma at the A.F. Masnikovin VVAUL school in Kachin. October 1972 - June 1977 - Attends evening classes for specialization as a KVVA pilot at the Jury A. Gagarin Centre. "Thinking of the Earth", 1987. August 1959 - June 1961 - Turner at the "Neftemash" factory in the Novocherkask Region of Rostov. 15 August 1961 - 22 October 1965 - Student at the A.F. Masnikovin VVAUL school in Kachin where he specializes in "Transformation and preparation of fighter planes". Jak-18 MIG-15 UTI, MIG-17 and MIG-21. 22 October 1965 - Executive Pilot for the North-Caucasus Region. 4 December 1965 - Pilot-instructor for VVAUL in Kachin. 10 March 1967 - Pilot Major. 22 April 1970 - Commander of the 684th Group IAP 119 IAD 48 VA Odessa in the City of Tiraspol. 27 April 1970 - With decree number 505 of the Central Committee, he is admitted to pilot-cosmonaut training courses. 6 July 1972 - Joins the first group of CPK cosmonauts (Space Flight Centre). 30 March 1976 - Promoted to cosmonaut for space missions. 30 January 1979 - Transferred to the group of specialized equipment cosmonauts. 25 January 1982 - Promoted to cosmonaut-researcher specialized in piloting Orbital Complexes. 30 June 1984 - Promoted to commander of the group of cosmonauts-researchers, keeping the role of Cosmonauts-Researchers Instructor. 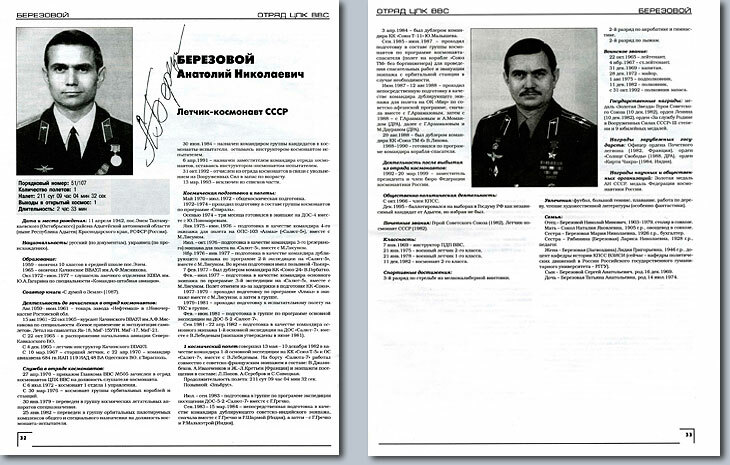 31 October 1992 - Exempted from the group of cosmonauts and the Armed Forces due to his advanced age. 13 March 1993 - Excluded from the reserve list. May 1970 - July 1972 - Participates in general training for space cosmonauts. 1972-1974 - Completes special "Spiral" training with the group of cosmonauts. Autumn 1974 - Three (3) months training with the crew of DOS-4 together with cosmonaut L. Ponomarev. January 1975 - June 1976 - Training as commander of the fourth flight crew on OPS-103 "Almaz" "Salyut-5" together with cosmonaut M. Lisun. July - October 1976 - Training as commander of the third flight crew (reserve) on "Salyut-5" together with cosmonaut M. Lisun. November 1976 - January 1977 - Training as commander of the reserve crew for the programme of the second expedition to "Salyut-5" together with M. Lisun. Code name for the mission "Tamir". 7 February 1977 - Reserve for V. Gorbatko, "Soyuz-24" crew commander. February - July 1977 - Training as crew commander for the programme of the third expedition to "Salyut-5" together with M. Lisun. Flight suspended due to the delay in delivery of the "Soyuz" space craft. 1977 - 1979 - Preparation of the "Almaz" programme together with M. Lisun and later as part of a group. 1979 - 1981 - Group training for the TKS research flight. February - June 1981 - Group training following the programme for the DOS-5-2 "Salyut-7" research expedition. September 1981 - 22 April 1982 - Training as crew commander of the first DOS expedition to "Salyut-7" together with V. Lebedev (June 1981 - confirmation of the members of the crew). Carried out from 13 May to 10 December 1982 as commander of the first expedition on board the "Soyuz T-5" towards orbital station "Salyut-7" together with V. Lebedev. On board the "Salyut-7" he works with a mixed Soviet-French crew including V. Dzahanibekov, A. Ivanchenko and J. Loup Chretien (France), and a mixed crew including L. Popov, A. Serebrov and S. Savitskaia. Length of the flight: 211 days, 09 hours, 04 minutes and 32 seconds. Name of the expedition: "Elbrus". July - September 1983 - Group preparation of the DOS-5-2 "Salyut-7" expedition programme together with G. Grechko. September 1983 - June 1984 - Training as reserve crew commander for the Soviet-Indian flight together with G. Grechko and R. Sharma (India) and subsequently together with a reserve crew G. Grechko and R. Malhotra (India). 3 April 1984 - Reserve for J. Malishev, "Soyuz T-11" commander. September 1985 - June 1987 - As part of a group follows a programme as "Rescue-Cosmonaut" (of the "Soyuz TM" craft without a flight engineer on board) to perform a mission to rescue the crew on board the orbital station if necessary. June - 12 August 1988 - Training as reserve crew commander for the flight to the "Mir" orbital station following the programme of Soviet-Afghan collaboration together with G. Arzamazov and A. Momand (Afghanistan) and later together with G. Arzamazov and M. Dauran (Afghanistan). 29 August 1988 - Reserve for V. Liahov, "Soyuz TM-6" commander. 1988-1990 - Preparation following the programme as commander of the rescue craft. 1992 - 20 March 1999 - Vice-President and member of the Cosmonautic Federation of Russia. October 1966 - Member of the Communist Party. December 1995 - Participates in the Parliamentary run-off election as Delegate-Representative of Adygei, but is not elected. USSR Hero (1982) and USSR Pilot-Cosmonaut (1982). 7 January 1969 - PDV VVS Instructor. 21 January 1975 - Second category Military Pilot. 21 January 1978 - First category Military Pilot. 11 December 1982 - Second category Cosmonaut. Third category with small-calibre rifle. Second category in acrobatic gymnastics. Second category in skiing competitions. 22 October 1965 - Sergeant. 4 November 1967 - Sergeant Major. 31 December 1969 - Captain. 28 December 1972 - Major. 1 August 1975 - Non-commissioned Officer. 11 December 1982 - Officer. 31 October 1992 - Reserve Officer. "Gold Star" Medal and Hero of the USSR (10 December 1982). "Lenin" Medal (10 December 1982). "Service to the Homeland and to the USSR Armed Forces" Medal, III grade. 9 commemorative medals from the Government. "Officer of the Legion of Honour" Medal (France - 10 December 1982). "Star of Freedom" Medal (Afghanistan). "Kirti Chakra" Medal (India 1984). The "Ciolkovski" gold medal (USSR Science Academy). Medal from the USSR Cosmonautic Federation. Football, tennis, swimming, woodwork, reading (mainly science fiction books). Father: Berezovoy Nikolai Minovich, 1903-1979, carpenter. Mother: Sokol Natalia Nikolaievna, 1905, gardener. Sister: Berezovaia Maria Nikolaievna, 1926, accountant. Sister: Riabinina (Berezovaia) La risa Nikolaievna, 1928, teacher. Wife: Berezovaia (Zagvozdina) Lidia Grigorievna, 1946, teacher at the KPSS VZISI History Faculty (present-day the Faculty for Political Changes in Russia) at the Russia State University. Son: Berezovoy Sergei Anatolievich, born on 16 December 1969. Daughter: Berezovaia Tatiana Anatolievna, born on 14 July 1974. "Twentieth Century Soviet and Russian Cosmonauts - A Practical Guide"
General Editing by Doctor of Law, Russian Pilot-Cosmonaut J.M. Baturin. Authors of the collection: I.A. Marinin, S.H. Shamsutdinov and A.V. Glushko. Printed with the collaboration of IMPEKSBANK.